China’s Long March 5 – ranking among the most powerful rockets in the world – is standing ready atop its launch pad on Hainan Island for liftoff this weekend with one of the heaviest, if not the heaviest Geostationary Satellite ever flown, test driving a new platform that enables future ultra-high performance satellites. Long March 5 is the most powerful member of China’s new line of rockets that debuted in the last two years to slowly phase into operational missions as the country aims to replace its antiquated rocket technology relying on lower-efficiency toxic propellants with modern rockets that are environmentally friendly and offer a much greater performance which is badly needed to meet China’s ambitious goals in human spaceflight and robotic solar system exploration. The Long March 5 took flight for the first time on November 3, 2016 – lighting up the night skies over its picturesque launch site after a dramatic countdown that had engineers and controllers scrambling to work around a series of issues that cropped up as late as T-2 minutes. 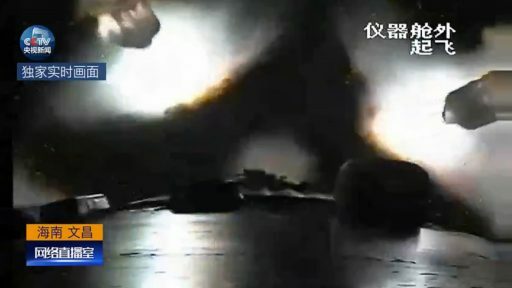 Rising from its pad, Long March 5 provided quite a sight as it streaked into the night under the power of its four large boosters and cryogenic core stage. The mission was not without trouble and suffered a premature shutdown of the rocket’s second stage, requiring the YZ-2 upper stage to use performance margin planned for the inaugural flight to compensate and inject the Shijian-17 satellite into the planned Geostationary Drift Orbit. Engineers are hoping all teething issues were ironed out and Long March 5 will be able to demonstrate its reliability on Sunday’s flight in order to clear the heavy-lifter for its upcoming high-profile mission in November, lifting the Chang’e 5 lunar sample return mission. Long March 5 will also be called upon for the launch of China’s first Mars Global Remote Sensing Orbiter and Rover Mission in 2020 and it will lift the Tianhe Core Module and two science laboratory modules for the Chinese Space Station starting in 2019. 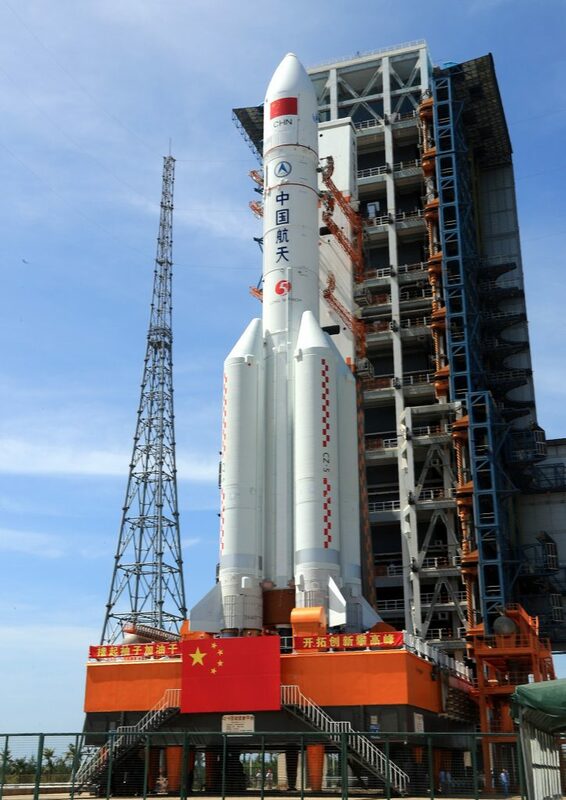 Sunday’s launch appears to be targeting liftoff around 11:20 UTC, 7:20 p.m. local time based on navigational warnings, however, as shown by the last mission, Long March 5 can have an extended launch window if the satellite’s specifications allow. 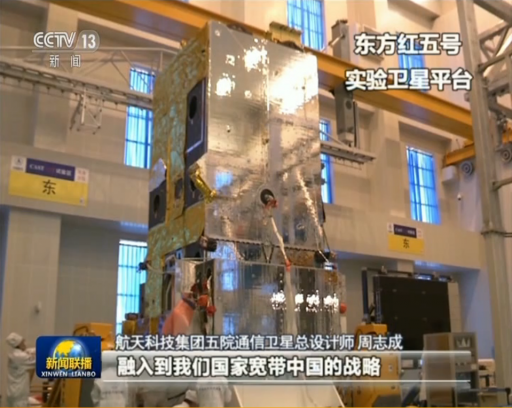 Hidden under the rocket’s payload fairing is Shijian-18, an experimental communications satellite that is debuting the DFH-5 next-generation satellite bus developed by the Chinese Academy of Space Technology (CAST) for future ultra-high performance communications satellites. 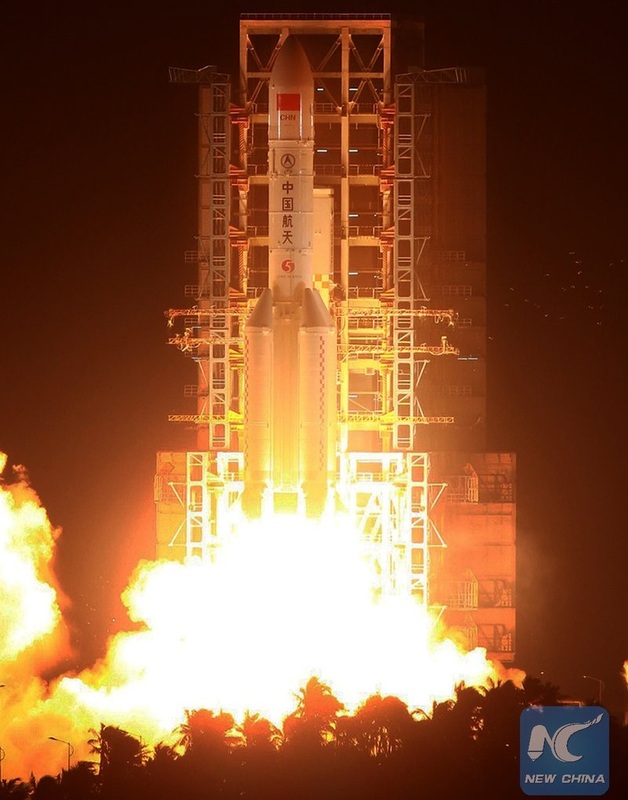 With a reported launch mass of seven metric tons, Shijian-18 appears to be the heaviest unclassified Geostationary Satellite launched to date, surpassing the TerreStar-1 satellite that is the current record-holder with a launch mass of 6,902kg. The DFH-5 satellite platform builds upon new satellite technology developed for the current-generation DFH-4 platform and adds a number of innovative developments such as a truss structure building the backbone of the large satellite, new 2D Twice Deploying Semi-Rigid Solar Arrays, advanced thermal control systems with deployable radiators, and a new type of self-controlled propellant system. DFH-5 uses hybrid propulsion with chemical thrusters and new high-thrust ion propulsion for stationkeeping over extended mission lives. 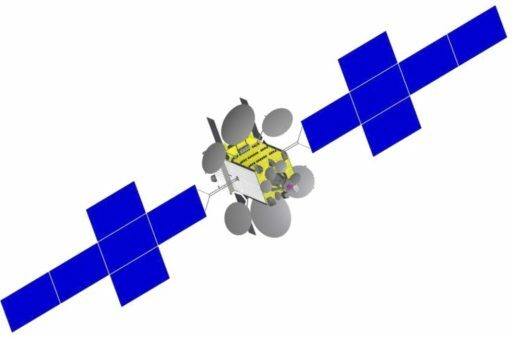 According to CAST, DFH-5 more than triples the payload capacity of current satellites and future iterations of the vehicle may weigh up to 9,000 Kilograms and support payloads of up to 2,200 Kilograms with a payload power of up to 28 Kilowatts – surpassing any satellite bus currently in operation. Shijian-18 is outfitted with a powerful High-Throughput Payload operating in Ka-Band and delivering a number of high-capacity beams. China launched its first high-throughput satellite earlier this year (Shijian-13) with a total data throughput of 20Gbps, to be eclipsed by Shijian-18 that will deliver a throughput in excess of 70 Gbps. CAST says the DFH-5 satellite platform will be suitable for China’s highest capacity communications satellites and the bus will also be available to international customers looking for high-power applications. Other potential uses of DFH-5 are in Earth Remote Sensing and some technologies developed for the program, such as the LIPS-300 ion thrusters, could be adapted for Solar System missions like asteroid explorers. 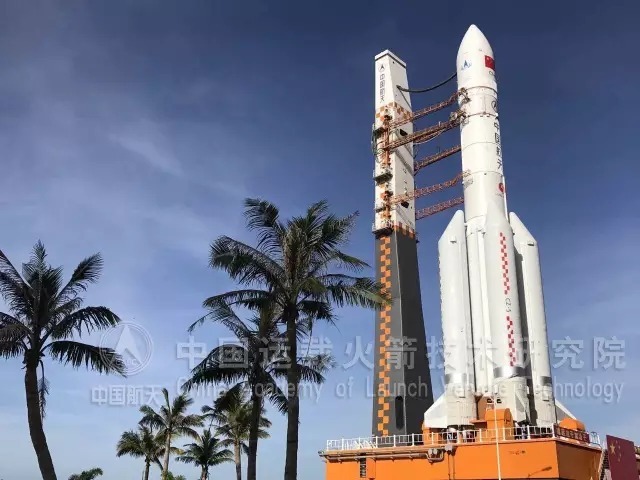 This weekend’s mission with Shijian-18 will significantly reduce margins for Long March 5 versus the launch of the ~4-metric ton Shijian-17 last year, not allowing for performance shortfalls on any stage of the flight. The three-stage version of Long March 5 can lift 14 metric tons into a standard Geostationary Transfer Orbit and around 4,500 Kilograms directly to Geostationary Orbit; Shijian-18 is likely aiming for a GTO with reduced delta-v to GEO (either through a supersynchronous injection or a multi-hour ascent with perigee-raising maneuver). 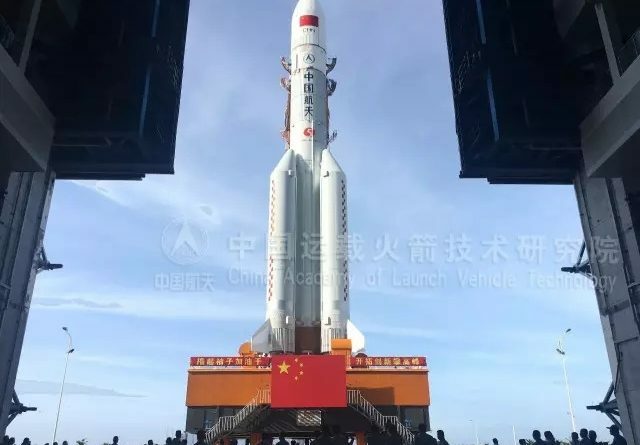 If launching at the expected time on Sunday, Long March 5 will take flight just seven minutes after sunset, making for a potentially spectacular scene as the vehicle rises into illumination before flying toward night. Overall, Long March 5 stands 57 meters tall and weighs 867 metric tons at liftoff – employing two five-meter diameter cryogenic rocket stages, four Kerolox boosters and an optional hypergolic-fueled YZ-2 upper stage capable of multiple engine re-starts. Ignition sequence start will be commanded at T-10 seconds, with the twin YF-77 engines on the core stage firing up first to reach operational conditions before the boosters command their eight YF-100 engines to ignite and lift the rocket off the ground with a total thrust of 1,078 metric-ton-force. Clearing its 92-meter tall Service Tower, Long March will pitch and roll onto a south-easterly departure path to head towards the equator as part of a standard Geotransfer mission design. 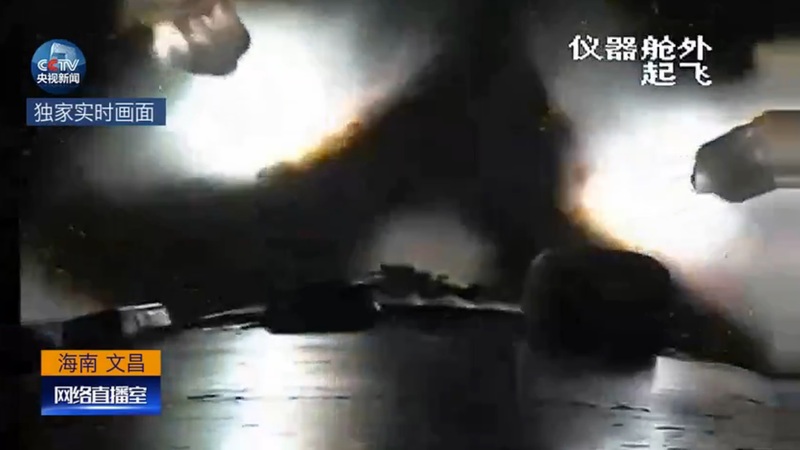 The four boosters, each with its own pair of YF-100 engines that builds a common element of China’s new rocket series, will fire until T+173 seconds, each burning around 135 metric tons of Liquid Oxygen and Kerosene to deliver 240 metric-ton-force of thrust. Separation of the 27-meter long, 3.35m diameter boosters will occur over 70 Kilometers in altitude via separation motors. Heading on towards orbit, Long March 5 will rely on its two YF-77 cryogenic main engines for another five minutes, delivering 143 metric-ton-force of thrust when flying through the rarefied upper atmosphere. 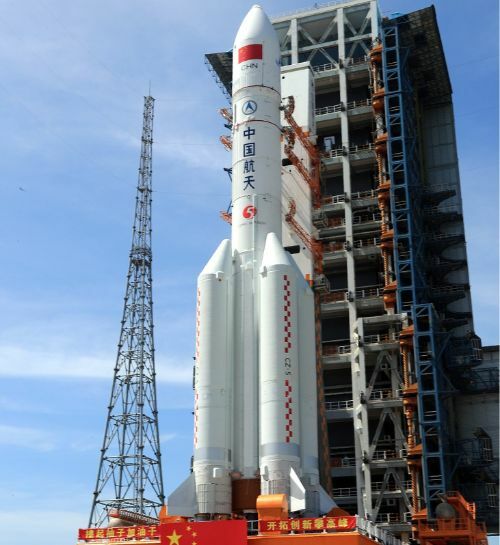 YF-77 is China’s first high-thrust full cryogenic engine, marking a significant technological development. Employing an open staged combustion cycle, YF-77 was built to be efficient at sea level and in the tenuous upper atmosphere to be suitable for a long-burning core stage. Separation of the 12.5-meter long fairing halves is expected a little over four and a half minutes into the flight when Long March 5 will be well over 120 Kilometers in altitude where aerodynamic forces are no longer a concern to the satellite. The core stage will finish its job just shy of T+8 minutes, having burned through some 160 metric tons of Liquid Oxygen and Liquid Hydrogen to accelerate the stack to ~5.8 Kilometers per second. Separation of the 33-meter tall core will follow within seconds of shutdown to clear the rocket’s second stage for ignition. Stage 2 is powered by a pair of YF-75D engines, each delivering nine metric-ton-force of thrust, employing an expander cycle in which the Hydrogen propellant is expanded into is gaseous phase to drive the turbopumps. 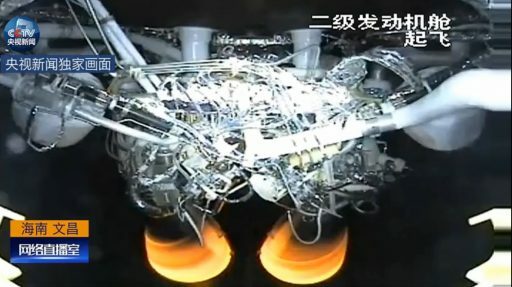 The engines are highly throttle-able and can be ignited multiple times to allow Long March 5 to support flexible mission profiles. A standard Geotransfer mission comprises a pair of firings of the second stage, the first a little over six minutes in duration to raise the vehicle’s speed by two Kilometers per second and reach a Low Earth Parking Orbit around 170 Kilometers in altitude. Concluding its first burn, the second stage will coast for ten minutes to move to a position close to the equator for the second burn, aiming to place the vehicle into a Super Synchronous Transfer Orbit peaking around 46,000 Kilometers above Earth. Spacecraft separation is expected just over thirty minutes into the flight.